Here’s a little more info on the popper and how I’m using it. After the sun has been getting up around mid mornings there are options. You can continue on with the surface lures and get a few good bass or stripers throughout the day but I’ve been switching to a few other baits with great success. If I want to hit the banks or points in the wind a good choice is the Mini Me spinnerbaits by Spotsticker Baits. This is a great bait for these windy spring days and my favorite has been a white profile, white blades and I’ve been adding one of my little 3.5 inch fluke baits as a trailer. 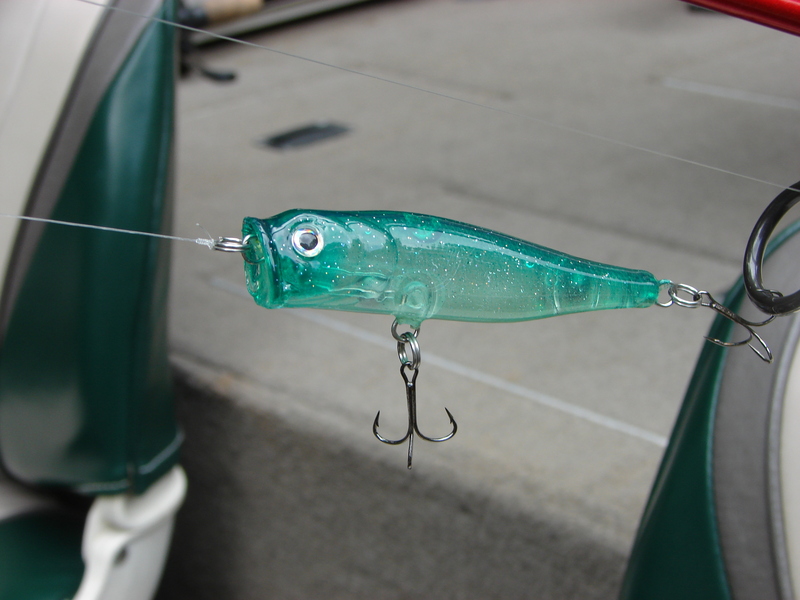 On windy days spinnerbaits are a must this spring for wind-blown points and shoreline. If you like to hit the docks like I do, we’ve been having great success with 2 options right now. The first is my favorite which is the shakeyhead with a 6 inch trick worm in just about any darker color. There are a lot of different worms that will work on the shakeyhead around docks but I like the bigger 6 inch trick worms because it cuts down on the dinks. You can feel the dinks pecking at the bait but the bigger bass have been hammering the bigger worms. The shakeyhead is a finesse type tactic but once you get the feel for it, it’s the Bomb! The best docks for the shakeyhead right now are the ones with natural rock. Just about every dock we’ve been hitting with natural rock has been holding fish. A good choice for your shakyheads are the Spotskicker Screwball Shaky in a 1/4 ounce or 3/16 ounce in a green pumpkin color. Here’s a tip: dip the tail of your worm in a little Spike-it garlic flavored chartreuse worm dip. It seems like the bass have been holding the worm longer with the garlic flavor. Here’s a couple nice fish from last week on the shakyhead. Another tactic that has been good for numbers around the docks are weightless fluke style baits. We’ve been rigging white weightless flukes and throwing them inside the empty slips or as far back between docks as you can get it. You can’t get too shallow with a weightless fluke. Just cast it, let it sink for a few seconds and just bring it slowly back to the boat in short jerks and then stopping and letting it sink again. This tactic is always good in the spring for these active bass and sometimes a hungry striper. Guys, there’s a lot of baits that work right now and as usual the spring provides us some great opportunities for a few fish. Even if you just get a bucket of minnows and take the kids for a day on the lake, right now the rewards can make memories that last a lifetime! Good luck this spring! When I joined the Greater Atlanta Bass Club back in January, one of the first things I saw was that during the year the club was making 2 trips to Lake Guntersville in Al. The first was in April and I was really looking forward to making the spring trip. For a bass fisherman, a trip to Lake Guntersville is a must but it can be a challenge. I started doing research on the lake and found a few videos and articles about the lake so I went to work on tackle for the trip. I made a few swim baits, swim jigs and crankbaits for fishing the shallow grassy lake. I also found a couple videos on frog fishing the shallow grass beds and lily pads along the shoreline with artificial frogs. I was particularly interested in the frog fishing as it looked like a lot of fun and basically, not much different than topwater fishing on Lanier. The only difference is that on Lanier there is no grass but the concept is the same, the bass are deep in the Guntersville grass and watching overhead for the occasional meal to happen by. I especially got excited about the frog fishing when I watched a fishing show on tv with Roland Martin fishing with frogs in heavy grass. Roland was just hopping his little frog on top of the grass mats and out of nowhere the bass would come from below and pop the little frog. Some of the strikes were large and some were no more than little pops as the big bass just sucked the frog in. At any rate, it was topwater fishing at its finest. I also watched a tv show with Jimmy Houston fishing Guntersville in the spring but they were doing a different kind of fishing. They were fishing way out on the main lake over the shallow submerged grass beds that are everywhere on the lake. Fishing these underwater grass beds can be fun but Jimmy also mentioned that you have to know where the fish congregate in the miles of grass. Jimmy said that if you didn’t know where the fish were you could spend all day fishing nonproductive waters and hiring one of the local guides to help is a good idea. That really wasn’t an option for me and I only had a little over a day to pre-fish before the tournament so the prospect of finding fish in the expansive main lake grass was not sounding like a winning strategy for the tournament. A few of my friends that had some knowledge of the lake said the frog bite was more of a fall bite but you could still catch a few this time of year on the frogs. With all that knowledge I gathered the time finally came and Lisa and I were on our way to Guntersville for a long weekend and a 2-day club tournament. We rented a little VRBO cabin on the west side of the lake and there was a public launch just a couple hundred yards from the cabin. As soon as we arrived and got all unloaded at the cabin it was midafternoon so we decided to launch the boat and do a little scouting. In the back of my mind I was committed to spending some time fishing the frog if I could find some shoreline grass beds. Once we launched I started looking at my lake mapping and found what looked to be a small cut across the lake that went back off the main lake so that’s where we headed. As soon as we pulled into the cut we saw some of what I was looking for, a grass-lined pocket with some reeds in the background lining the shore. My usual club tournament partner couldn’t make the trip but loaned us his “frog box” which had an array of frogs of all types but I also had 2 little Spro frogs that I had won from Eric Aldrich in a contest from a couple years ago. I told Eric I would give them a try someday when I got the opportunity. Well I got the opportunity so I tied one on for Lisa and put the other on for myself. Lisa and I were using some medium heavy rods with a stout braid spooled on our bait casters. When we pulled along side the weed line and started casting, it was apparent right away that we didn’t get a lot of distance with the heavier braid but the little Spro held water so once we got a little water in the spro’s we could cast them well enough to get them away from the boat to cover a good distance. It was a little awkward at first but it didn’t take long to get the hang of it. We started down the weed line throwing the frogs and working them back to the boat. I told Lisa that the best thing to do was try your best to imitate the way a frog would kick and swim across the weeds, more than likely in little short jerks on the frog. I grew up in the country and as a kid I took pride in being able to shoot a frog with my Daisy bb gun while the frog was on the move to escape my wrath so I indeed knew what a swimming frog looked like. Within minutes of throwing the frog a fish came from nowhere and whacked my frog, I felt the frog get sucked under but as quick as he sucked it down he spit it out. It was a pretty intense strike and at that point we were optimistic so our casts into the weeds had a little more getty up in anticipation of the next blow-up. A few minutes later I heard the distinct sound of a big fish blowing up on a bait and I looked back to see Lisa set the hook on the fish deep in the weeds. I could tell she was surprised by the fish and the rod bowed over. I told Lisa to pull hard and pull the fish out of the weeds. She laid into the fish and the rod went limp. We really didn’t know what happened but the braid had a clean cut when she brought the weightless line back to the boat. The braid was a little old but we couldn’t figure out what would have cut the braid unless there was a worn spot somewhere from casting. The biggest problem was we had lost one of our 2 Spro frogs and there were no frogs in the frog box like the Spro. We moved on down the weed line and before long another bass blew up on my frog and I was able to pull him out of the weeds in short order and I had my first Guntersville bass, a feisty 2lber. The next morning, Friday morning, our plan was to do a lot of looking and find a few new locations and a few more tactics for the upcoming tournament. We also wanted to find and fish some rip rap and test our skills at the submerged weed beds out in the open water of the main lake. As it turned out Friday was a very windy day and a very crowded day on the lake. Not only did we have the regular traffic from bass fishermen pre-fishing for the tournament weekend, there was also a high school championship tournament with no less than 325 boats with high school teams from all over the south. We stayed away from the weed beds we found a day earlier and just fished rip rap and docks. It was just too windy for us out on the main lake so we stuck to a lot of leeward rip rap and docks in pocket and bays. We used a variety of baits from shakey head to swimbaits, swim jigs, squarebills, jigs and lipless cranks. We caught small fish here and there throughout the day but it was a hard day of looking and fishing with not much to show for it in way of a game plan for day 1 of the tournament. Our plan for day one was to hit the primary frog spot the first thing in the morning and try and pull a good fish out of the grass to start the morning and then spend a little time back on the rocks, docks and rip rap. When we got to the ramp before dawn I believe everyone had the same idea we did, get an early start and be number one to your number one spot. We got to the ramp before at 5:30 local and it was already a zoo with a bass club launching out at the same time we were launching. We finally got clear of the boat launched and set up at our spot. We were the first to get there but the flights of high schoolers and club fisherman hadn’t got started. When they finally did there we no less than 3 boats lined up to fish the same grass line we were in but we had first dibs on the prime grass. Not too far away another bass boat started working the opposite side of the bay and the grass line there, as we got started it wasn’t long till we watched the other bass boat across the bay bring in a nice 2-3lber on a buzzbait but we just kept throwing the frogs. We watched them boat a second smaller fish on down the weed bed and I wondered if I should dig out my buzz bait or just keep throwing the frog. We kept on throwing the frog with anticipation of a blow-up and we were both optimistic that it would happen after our success on Thursday evening. At least 30 minutes went by with nothing happening and no interest in the frogs from the bass. It was getting crowded in the bay as a couple more high school boats showed up and I knew it was going to get harder and harder as boat after boat scoured the weed beds in our bay. Finally a huge blow-up engulfed my frog and I set the hooks on a bigger bass. She tried to shake the frog at the surface and then she dove into the grass but we were able to pull her out and into the boat. I guessed the fish to weigh around 6 and just about as big as my biggest from Thursday. I felt a relief that we were able to get a confidence fish in the boat to start the morning and I was hoping Lisa would be able to pull one in for a second fish. We pretty much got crowded out of the bay we started in so we moved to another spot only to find boats galore. You couldn’t find a pocket that wasn’t covered up with boats. It was a grind just to find a spot to yourself. We fished the remainder of the morning without another bite, working rip rap and some grass beds on the leeward side of some Islands. The wind had picked up and it was brutal. That’s one thing we learned about Guntersville, it’s a windy lake. Shortly after lunch we were working some rip rap and Lisa popped a good one which looked to be around 4lbs on a lipless crank. That brought her spirits up and she was eager to get another one. We kept going and a few minutes later something slammed a swimbait I was throwing. At first, when I felt the hit on the swimbait I thought it was a very large bass but as soon as I felt the fish pull I knew it wasn’t a bass but a catfish. Sure enough, when it came to the surface it only confirmed what I already suspected, Mr. Whiskers. We spent the last hour back at our frog hole but by then the boat traffic in and around the grass had scattered the once tightly bunched beds and it looked rough. We were sure boats had been in and out of there all day and it didn’t yield another fish all weekend. We wound up going to the weigh-in with 2 fish, my early morning fish being 5.93lbs and Lisa’s weighed very close to 4lbs. Our total tally was 2 fish and just shy of 10lbs. I knew that wasn’t going to hold as we were the 3rd boat to weigh in and there were about 30 other teams who hadn’t weighed in. I was sure our biggest fish was not going to be in the running for the big fish pot but as teams weighed I started feeling better about our big fish. There were a lot of fish weighed in but not very many hit the 5lb mark. Our 5.93 barely held through day 1 and we were in the money with the big fish pot for day 1. Although we didn’t have 5 fish or the weight to compete, at least we weighted a couple of decent fish. Lisa and I were both pretty happy campers going into day 2. Unfortunately, Lisa nor I thought about taking a picture of our fish from day one but it was on to day 2. Our strategy for day 2 was to hit the weed beds early then hit some rocks and rip rap, followed by some submerged grass out on the main lake. The wind was somewhat calmer on day 2 so more main lake grass beds came into play. We did check the shoreline weed beds early with the frogs but there was nothing there and nothing to show for it. When we hit the rocks, the first rocky point we pulled up to produced a nice fish for me on a crawfish colored lipless. We were very lucky because the fish was just barely hooked and was trying hard to jump and shake the hook. I saw the lipless just barely hooked by one barb when the fish jumped for the first time. I pulled the fish to the boat as quickly as I could and Lisa shoved the net under the big bass just as the hook released from the fishes’ lip. I was relieved and very proud of Lisa’s cat-like reflexes with the netting skills. The fish looked to be about 5lbs and a nice start to the day. We moved from spot to spot and fished the main lake grass as well as shoreline grass, rip rap and some rocky points we found with nothing to show for it. It was a nice day to be on the lake but the bass bite just wasn’t working for us. We wound up going to the weigh-in on day 2 with our one 5lb fish. When I talked with the tournament director he told me that on day 2 if no one caught a bigger fish than our big day 1 fish we would win the big fish pot for the tournament which sounded pretty good to Lisa and I but for a fish that size to last another day of 33 tournament boats on Lake Guntersville the chances were very small. After we weighed our fish we waited and watched as everyone weighed in. There were some nice fish weighed and some good numbers. I watched as sack after sack was weighed and every once in a while a big fish would hit the scale. There were a few fish over 5lbs weighed but one in particular that I thought was bigger than our 5.93 came up just shy at 5.89. That was the winning fish for the day 2 pot so we wound up winning the big fish pot for the tournament as well as the big fish pot for day 1. Lisa and I couldn’t have been happier for our first trip with the club. Lisa and I really enjoy traveling and checking out these different lakes and we really enjoyed Lake Guntersville. The fishing is a little different than we’re used to here on Lake Lanier but we both really want to go back again when we’re not tournament fishing and just spend a few days learning the lake as well as getting into more of that frog fishing. We had a great time and the folks in the Greater Atlanta Bass Club are some top notch fishermen and great guys. I believe the winning weight for the weekend was over 30lbs and we saw several teams bringing 5 fish to the scales, even with some spotted bass mixed in. Guntersville is just a short 3 hour drive from Lanier and I highly recommend a trip if you’ve never been. We first starting using the Emerald Popper on Lanier way back in September of 2014. It was a bait I made for a trip to Lake Burton to use on some early fall topwater Largemouth. Burton is a very clear lake and I figured the translucent bait would work perfectly for the conditions up at Burton. As it turned out the bass liked a translucent Sammy style bait I had made and we never even put the Emerald Popper in the water. After we returned from Burton Lisa and I made a early morning trip to some of my favorite spots in the creek. It was early fall and there was some surface activity so I started working a Sammy knock off and Lisa decided to tie on the Emerald Popper because it was something different and it looked kinda cool. On the first cast she caught a nice bass and followed it up with another one within a few more casts. I was steady working the walking bait with a couple of swirls to show for it and Lisa starting mopping up on me with the popper. “When I make baits, I always make at least 2 just to be on the safe side. There have been times when I’ve only made one prototype bait, only to have a big fish break it off and I’m standing there wishing I had made another one or two. For that reason I had another Emerald Popper in my box and I tied it on”. That was the start of a very fun fall topwater season. Lisa and I caught fish all through the fall with the popper but the stripers wouldn’t touch it. I just figured it was one of those baits that bass liked but it couldn’t interest the stripers. During the early spring of 2015 I started using the big bone Vixen so the topwater popper stayed in the box while we used the Vixen throughout the spring and early summer. When the fall of 2015 rolled around I broke out the popper again and to my surprise I started catching stripers with it while bass fishing. I also used it to target sight fishing topwater stripers that were coming to the surface. Lisa and I would take the boat out on nice fall evenings, watch for surfacing schools of stripers and run and gun using the popper. We were also catching some nice fish during the fall days with the bait. One of the reasons we have been having good success with the bait and the stripers is because I made a small change to the bait and replaced the KVD hooks with Eagle Claw nickel plated 375 trebles and added a holographic streamer dressed treble hook trailer. I added the dressed treble hook to help stabilize the bait and the holographic streamers added a little flash to the bait. We had a lot of fun with the bait and once again, this spring has produced some great bass and stripers on the bait. If you watch the videos below you can see that it’s usually a combination of popping, splashing and waking the bait that makes it work. When I’m waking the bait it looks like it is swimming and the little dressed treble in the back is swaying back and forth as it swims. Between the color of the bait, the action as well as the ripple lines it creates when waking the bait, the fish can’t resist it. Most of the time if the fish misses on the first strike the fish won’t quit on the bait until he’s hooked. We’ve also caught fish 2 at a time on the bait which has been a nice surprise. Here’s some of my favorite videos and pictures of the popper in action. If you enlarge the first video you can see the big striper bird dogging the popper back to the boat before he blows up on it. Unfortunately my camera lens was fogged/iced over from the cold morning. I got out Tuesday, Wednesday and yesterday this week and started with water temps in the upper 50’s on Tuesday. I mainly fished inside Shoal and Bald Ridge creeks this week. I caught a few fish with a spinnerbait around docks in the backs of pockets early in the morning and out on windy points later in the morning but the real numbers came from a shaky head on docks in the afternoons this week and also topwater on points. If you really want to sharpen your shaky head skills, now is the time because there are a lot of fish on the docks in the afternoons and the shaky head is a great tactic right now with these active fish. I’ve been catching a lot of smaller fish on the shaky head but every once in a while I’d get a nice one. For my shaky head I’m mainly using a 1/4 ounce Spotsticker Screwball Shaky in green pumpkin with a dark colored BPS Tournament Series 6″ trick worm. I’ve been dipping the tail of the worm in a little chartreuse garlic dip. You can see a picture of the trick worm color below. I like the 6 inch because it cuts down on dinks but I’m sure the smaller worm sizes would work great for better numbers. I’m using my light spinning gear with 6-7lb fluorocarbon. I’ve just been pitching and dropping the worm around the edges and inside slips as well as up in the shallow gaps between the docks. Docks with rocky shoreline has been the best producer for me. To me this is finesse fishing and kinda reminds me of drop shot fishing as you’re mainly fishing by feel and most of the time just feeling for a small tap. A lot of times the fish just picks up the worm and starts swimming off with it so I watch my rod tip and line angle and keep the slack out of my line as much as I can. Most times when the fish swims off with the worm it just feels like spongy weight and that’s when the hook set comes in. I probably have just as many missed hook sets as I do good ones but the shaky head in the afternoon around docks has been a lot of fun this week for numbers. I didn’t fish yesterday but when I got out around 9:30 this morning (4-1-2016), water temps were in the low 60’s and the topwater was on! It pretty much started on my third cast and I caught some pretty nice fish out on points and over brush today, plus I left them biting. It stayed overcast which kept the topwater bite going throughout the day. There was also just the right amount of chop on the water and I was setting the boat up wind and casting down wind across the points and then bringing the popper back against the wind. I did a lot of popping, splashing and waking to get the fish to come up and I saw very little surface activity other than when they would come up to whack the popper. If I had a brush pile marked out on a point I positioned the boat up wind of the brush and cast the popper down wind and brought it back over the brush pile and caught fish at just about every stop. I did the same thing with the spinner bait this week and also caught fish over brush when the wind kicked up to high for the popper to work on the points. If the water temps continue to climb I think the topwater bite should do well and I think the bass should stay on the docks for a while. Here’s a few pics and a little bit of video from this week.